Despite their ever-dwindling numbers and the fast approaching Xbox Live expiration date, a group of diehard Halo 2 fans are still playing an ongoing seventeen day match. 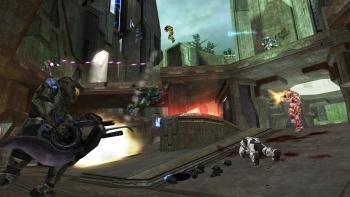 As mentioned in a previous post, a group of gamers have been steadfastly playing Halo 2 day and night since April 15th. The stalwart group of 24 has now dwindled to a mere 5, who have kept a Halo 2 match going on for seventeen straight days. Players have been slowly dropping out, not due to exhaustion as one might believe, but from problems with overheating and iffy internet connections. A small band of a committed few, engaged in a battle against insurmountable odds. It's not Noble team from Halo: Reach, it's the final, passionate few who are still playing Halo 2. We wish them the best in their battle against time. Their tremendous exhibition of courage and commitment makes them ideal candidates for Noble team and therefore we are working to ensure they have everything necessary to participate in the Halo: Reach beta. As of this writing, there is but a few of the Noble team left. You can follow them on the Bungie forums.